While it has gotten a media resurgence with the advent of VR, 360º photography is by no means a new medium. Since 2005 Flickr, a Yahoo-owned photo sharing site, has supported a relatively large community of 360º photographers with “tens of thousands” of 360º photographs uploaded to the site. So it came as no surprise when they announced an upcoming VR app in September. Now, three months later, Flickr has released Flickr VR for the Samsung Gear VR, but from my initial impressions it probably could have done with a little more time in the tank. This works most of the time, but I ultimately found it to be a limited way to browse and encountered a few errors and bugs during my time with the app. For starters there were a number of photos which failed to load for me on the first try, instead displaying a placeholder blue 3D grid with a black horizon. I also found the UI to be a little sensitive, and a number of times when I tried to swipe to the next photo I instead brought up the menu. These are small refinements that can likely be made with updates in the future. The most glaring thing missing, however, was the ability to search through and share photos. Right now the curated selection is a very unintuitive way of browsing through various photographs. If the app was even to add categories and albums that would be a massive improvement over the overloaded content stream that it is now. Sharing is also something that isn’t available with the current app, so it appears that for now the only way to get your own pictures on the app is to upload them to the group and cross your fingers that they will be selected. We have reached out to Flickr to find out more, and will report back if we hear anything. 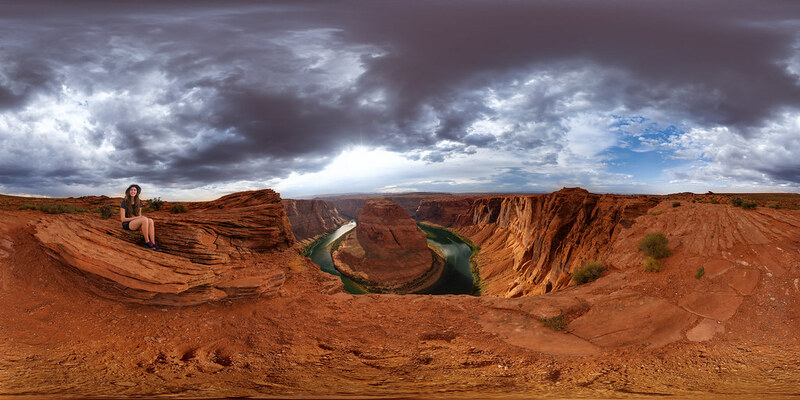 Alongside the Gear VR app, Flickr is also releasing a 360 photo viewer for the browser. According to Flickr, the site will soon automatically detect 360º images and enable a VR viewer on the photo page, but it is unclear if that means it will be viewable in a headset. Flickr says “this is only the beginning” and that there will be “new features and experiences for 360° photos for VR headsets, web and mobile” in the future. Overall in its current state, the Flickr app feels slightly redundant, however, it has quite a bit of potential to grow and with some refinements could become an excellent repository of still immersive content, especially if it can integrate with Google’s upcoming Cardboard Camera social features. UPDATE: You will soon be able to add your own photos to the app. WebVR functionality is incoming, once Firefox has released WebVR functionality into the stable channel. @WBMason @Flickr We’re waiting for Firefox to release into the stable channel to enable our webVR features.